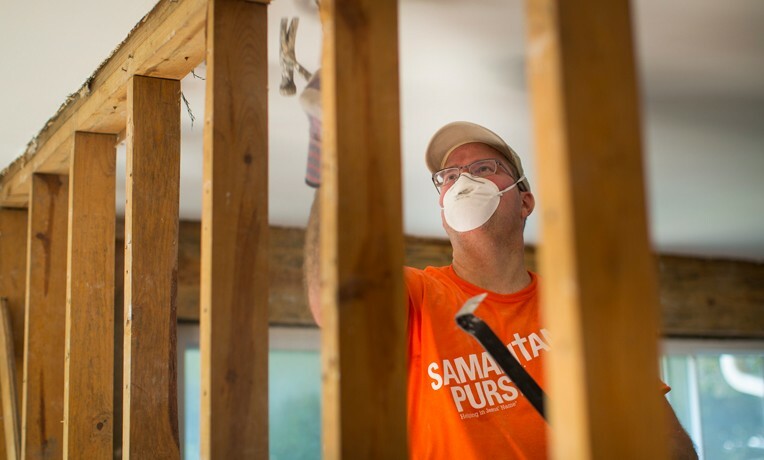 Samaritan's Purse volunteers serving in South Carolina are demonstrating the love of God to homeowners devastated by recent flooding. Samaritan’s Purse quickly responded to historic rains and resultant flooding in the state of South Carolina this month, and we continue to serve affected homeowners there. Volunteer in South CarolinaSamaritan’s Purse U.S. Disaster Relief is on the ground in the capital, Columbia, where we are based at Shandon Baptist Church. At this site, there’s been a huge outpouring of volunteers from around the city, state, and even from across the country. 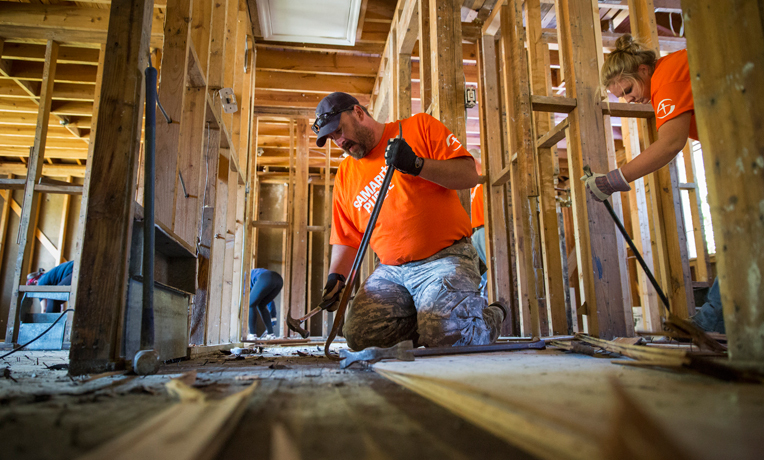 Dozens of our orange-clad volunteers continue to work daily, tearing out water-logged walls and flooring. We also established a second base of operations in north Charleston at the First Baptist Church of Jedburg in Summerville. Samaritan’s Purse has now completed our work in Summerville and is relocating to Georgetown County. The water has recently receded in that area leaving hundreds of homes devastated by the flooding. Samaritan’s Purse will base operations out of First Baptist Church of Andrews, a central location to the hard-hit areas. Our teams will deploy from there to help serve those who have been impacted by the devastating floods. Former Army Corporal Charles Stewart, who along with his wife Jennifer benefited from the Samaritan’s Purse Operation Heal Our Patriots program in Alaska, rips up waterlogged flooring. A team of chaplains from the Billy Graham Evangelistic Association’s Rapid Response team has deployed alongside Samaritan’s Purse. These crisis-trained chaplains work to share the love of Jesus Christ, providing spiritual and emotional care to victims and families. As of October 20, nearly 1,300 volunteers have served, racking up over 16,000 hours of service between the two sites. So far, 15 salvations have been reported. South Carolina Governor Nikki Haley, joined by some of her staff, volunteered at our Columbia site on October 15. “I can’t tell you how much Samaritan’s Purse means to South Carolina right now,” Governor Haley said. “When this happens, people are traumatized. They don’t know where to go and don’t know who to turn to. So, when the army of Samaritan’s Purse volunteers show up in a neighborhood like this one or any other, people feel safe. People feel like there’s help and people all of a sudden realize they can find the blessings in something that happened that’s so tragic. You can read and watch more about the Governor’s visit here. On October 13, Cissie Graham Lynch, daughter of Samaritan’s Purse President Franklin Graham and his wife Jane, served in Columbia alongside her husband, former NFL player Corey Lynch. You can read and watch more about Cissie and Corey’s visit here. Please continue to pray for South Carolina homeowners as they recover from flooding. Pray for our staff and volunteers as they minister in Jesus’ Name.